The weather’s getting warmer and that means pool parties, BBQs and picnics! If you’re looking for dessert ideas to keep you cool or satisfy your sweet tooth this summer, here’s a list of Skinnytaste summer desserts just in time for Memorial Day! Hi Gina, whatever happened to your Green Tea Sorbet? Love your recipes ~ use them all the time! well once in a while we need treats, hope you all enjoy! Oh, Gina! I just love what you've done! Thank you for the Summer Dessert collection. I love your recipes! Your entire collection is my "go to" for many a meal or celebration. Yum! 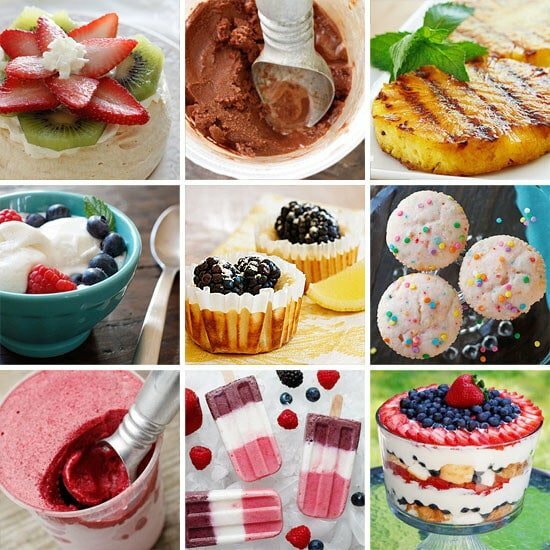 What a great collection of healthy summer dessert options! Mmm…I can't wait to make one of these for our next BBQ, it's going to be very hard to decide since they all sound so yummy 🙂 I'm thinking the strawberry swirl cheesecake or the popsicles! This dessert list totally saved my day! I have had a major sweet tooth lately but did not want to ruin all my exercise efforts by purging on desserts. And the fresh strawberries and cool whip every night is getting old.